This is a comfortable position for performing many relaxing activities. Read a book, watch television, work on your tablet or enjoy conversation with family and friends. A 2-position lift chair allows for two distinct positions: “Straight” and “TV recline.” Its back and ottoman operate in tandem (i.e. 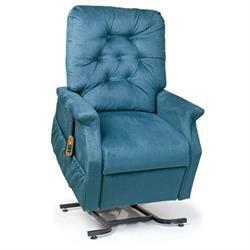 the backrest reclines as the footrest raises) and can be controlled manually, or via handheld remote. If you enjoy the support that a recliner provides, but find it difficult or impossible to sit down or stand up without assistance, 2-position lift chairs are an ideal option.